My Canadiana: The Sweet Version | Mmm, Tasty! As mentioned in yesterday’s post, this month’s Sugar High Friday has a theme of ‘Mmm…Canada!’ and has two editions: sweet and savory. Yesterday I posted about a Maritime fast food treat, garlic fingers. 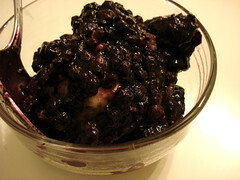 Today I’m posting about a Maritime traditional sweet treat – Blueberry Grunt. Blueberry Grunt is a somewhat unusual dessert. A wild blueberry sauce is topped with a sweet biscuit dough (dumplings), and the dough is steamed until puffed up and cooked through. It is similar to a blueberry cobbler, but is never baked, so the dumplings are not browned. The dish isn’t really well known outside of the Maritime provinces; mentioning it to the typical Ontarian will get you a strange look. A bit of research has found that the dish may have originated with the Acadians, French settlers in the Maritimes. In order to make it, I had to try to find wild blueberries, which was a bit of a challenge this time of year; wild blueberries are really only available fresh in the late summer and early fall. I tried many different markets in my neighbourhood, but always found only the larger, cultivated blueberries (which we refer to as ‘tame’ blueberries in our house). I figured that would be the case, but you can’t blame me for trying! So instead I headed to the freezer case and grabbed a bag of frozen berries. As I find the cultivated berries tasteless, I figured this would be the better solution. For sauce: Heat berries, spices, sugar, lemon juice, and water in a skillet. Boil gently for 5-10 minutes, until well blended and liquid has slightly reduced. For dumplings: Sift flour, baking powder, salt and sugar into a bowl. Cut in butter and add milk, a few tablespoons at a time, until the mixture is a soft biscuit dough texture. Drop by spoonfuls into hot berry sauce. Cover tightly with a lid and simmer for 15 minutes. Do not peak into the pot during this time! After 15 minutes the dumplings should be puffed and well cooked through. Serve with whipped cream or vanilla ice cream. Makes 4 generous servings. For those who read us for the restaurant reviews, I’ve got a couple coming soon.